Stimulates the development of the immune system in all species, it is indicated as a coadjuvant treatment in any cases of infections, fever, delayed growth, and other conditions. Its inmune stimulating action is due to celullar and humoral immunity development, improving interferon secretion and boosting white blood cell capacity. As a result of its use, it increases the antibody titer achieving a better immunity after vaccination. In addition, inhibits viral replication and prevents disease outbreaks such as: swine fever, swine flu, PRRS (Porcine reproductive and respiratory syndrome), and PCV (swine circovirus). As an aid in the prevention and treatment of poultry diseases such as IBD, Newcastle, influenza, etc. 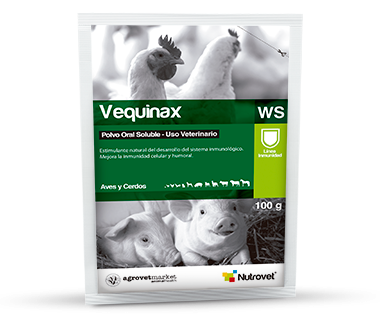 Poultry and pigs: in general: 50 - 100 g/200 L of water or 50 - 100 g/100 kg of feed. Poultry: as adjuvant therapy of viral diseases: 100 g in 150 L of water or 100 kg of total feed for 5 - 7 days; broiler chickens/ducks/turkeys: 100 g in 200 L of water after vaccination or between day 1 to 3 of age and thereafter, every 10 days for 3 consecutive days; layers: use it for 3 days each month or after vaccination, 100 g in 200 L of water. Pigs: piglets: mix 100 g with 100 kg of feed and use it for two weeks; sows: 100 g in 150 kg of feed or 300 L of water, use it 7 days before mating, 7 days after delivery and 7 days after weaning for 3 - 5 days; pigs between 13 and 17 week old: 100 g in 150 kg of feed or 300 L of water for 3 - 5 days. Other animals: horses and cattle: 1 - 2 g/50 kg of b.w. ; young horses and cattle, sheep, goats, camelids: 1 - 2 g/animal; dogs and cats: 1 g/10 kg of b.w. ; guinea pigs, rabbits and ornamental birds: 0.3 - 0.5 g/animal.